THPBlog: Mendocino Redwood Company planning THP on steep and unstable slopes near Branscomb. Mendocino Redwood Company planning THP on steep and unstable slopes near Branscomb. THP 1-13-086 MEN (Jack of Hearts THP) Mendocino Redwood Company, 655 acres; 34% transition, 33% group selection, 29% variable retention, 4% rehab, 1% roadside logging. Upper Hollow Tree Creek, Jack of Hearts Creek (MD: T22N R16W Sec.19, 30, 31; T22N R17W Sec.24, 25). 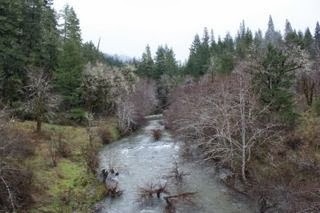 Wet weather operations, high erosion hazard, landslide terrain, road failure sites, steep slopes over 75%, 15 road drainage work sites, impaired 303.d watershed, herbicides, coho watershed, 5 spotted owls within 1.3mi, trees up to 44” dbh. Estimated public comment deadline: 11/10/13. This THP is about 5.5 miles NW of Branscomb, CA on the Coast Range between Highway 1 and Highway 101. Mendocino Redwood Company is planning a tractor and cable logging operation in second growth Douglas fir and redwood forest at an elevation of 1,440 to 2,160 feet. The THP area flows into the South Fork of the Eel River which is listed as impaired for sediment and temperature. There are numerous general erosion sites along the Elkhorn Ridge Access Road, and 8 unstable areas in units 2,4,7,8,9 & 10 including scarps, and failures related to streams, skid roads and existing roads. An existing seasonal road will be used within a Class I watercourse, and 3 skid trails on slopes greater than 65% are proposed for ground based yarding. Fifteen road drainage work sites are planned including dip construction, rocking, culvert repair and replacement and road bed stabilization. More information is available on the THP Tracking Center website.